Beth Moriarty, known to fans of PlanetPurl.com as the “PurlQueen,” has shared her online classes and instructional videos with almost 2 million views by knitters and crocheters since 2010. She also designs individual downloadable patterns which are available under the PurlQueen Patterns label (PurlQueenPatterns.com). Beth learned to knit in junior high school. After a couple of scratchy neon-colored acrylic (the latest thing!) garter stitch scarves, she put the needles away in favor of chasing boys. 30 years later (married and with a fully grown “boy” of her own), she began knitting again. She loves to travel and made a plan to use her hundreds of thousands of frequent flyer miles to do some non-work-related traveling, with the plan to buy yarn everywhere she went. Frustrated with the lack of online resources, she started Planet Purl which began as a tool to make it easier for traveling knitters and crocheters to find yarn anywhere. Planet Purl soon grew into the world’s largest online directory of yarn shops, combining two of her passions, knitting and traveling, in one place. Beth’s first book, Deep South Knitting was published in 2011, with 25 projects inspired by the history and beuaty of the American South, together with travelogues and a dozen of her favorite southern recipes. 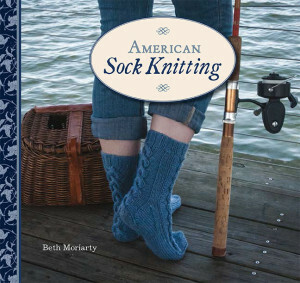 American Sock Knitting, with 13 designs, travelogues and five yummy regional recipes, is the first book in the “American Knitting” series. American Gift Knitting will be released in the Fall of 2013. Beth lives in Orlando, Florida and near Blowing Rock, North Carolina, with her husband Michael Langan, and their three dogs, Paris, Italia, and Chelsea. She can be found most days either in the studio up to her elbows in yarn, or in the kitchen up to her elbows in some new culinary adventure.